When McCann Worldgroup holds its new employee welcoming ceremony on April 1, there will be one standout addition to the agency. Along with hiring 11 recent college graduates, the agency will also add AI-CD β (AI-CD beta), the world's first artificial intelligence (A.I.) creative director. AI-CD beta will work for McCann Japan and was developed through the "Creative Genome Project," the first project undertaken by McCann Millennials, a taskforce launched last September by agency employees in many an advertiser's dream demographic. "Artificial intelligence is already being used to create a wide variety of entertainment, including music, movies, and TV drama, so we're very enthusiastic about the potential of AI-CD ß for the future of ad creation," said Yasuyuki Katagi, president & CEO of McCann Japan. "The whole company is 100 percent on board to support the development of our A.I. employee." 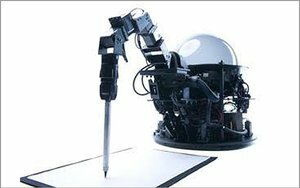 AI-CD beta took six months to create and test and will write the creative direction for commercials on a piece of paper with a brush attached to its robot arm. When developing the A.I., the Millennials team deconstructed, analyzed and tagged TV commercials, including the winners of the All Japan Radio & Television Commercial Confederation's annual CM Festival (ACC CM Festival) awards for the past 10 years. AI-CD beta was designed to mine the database and creatively direct the optimal commercial for any given product or message. For example, AI-CD beta will give direction based on the tags that the team has selected from the ACC work. The McCann Japan Millennial team said they now have enough data to take on a creative brief from a client. One of McCann Japan's multinational clients, as yet unnamed, has agreed to work with AI-CD beta on an upcoming campaign. With AI-CD beta, the agency can produce work via logic-based creative direction from past TV commercial data. "Our team didn't have a creative director, so we thought, why not create one ourselves with artificial intelligence," said Shun Matsuzaka, creative planner at McCann Japan and the founder of McCann Millennials. "That's how the Creative Genome Project got started. Our hope is for our A.I. creative director to work on many projects, gain experience, and to grow into a world-class creative director that will leave a mark in the advertising industry." 3 comments about "No Joke, McCann Japan Hires First Artificial Intelligence Creative Director, Starting April 1". Maarten Albarda from Flock Associates (USA), March 30, 2016 at 11:28 a.m.
@Amy Corr: You do know it is April fools day, right? Don Klos from KMC, March 30, 2016 at 12:39 p.m.
Tom Cunniff from Tom Cunniff, March 30, 2016 at 4:56 p.m. The joke is on the creative staffers, who probably think it's hilarious that an AI could ever take their jobs. AI companies like Narrative Science and Persado are already doing amazing things. It's just a matter of time before the machines take over a majority of the mundane work. The writing is on the wall, kids, and it was written by an AI.